Back in 2009, UVA’s historic preservation project manager James Zehmer (Arch ’02) and conservator Mark Kutney were walking under the Rotunda’s south portico when they noticed a small pile of what appeared to be sand at their feet. But it wasn’t sand—it was a piece of a marble capital that had fallen and shattered upon impact. 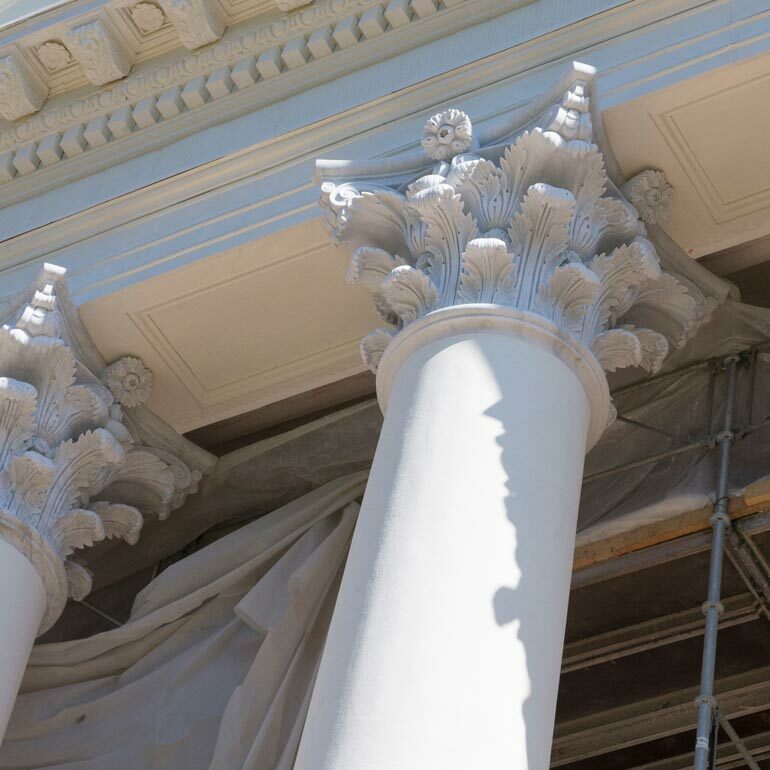 A close examination revealed that the capitals were beyond repair, and they were immediately swathed in black hardware cloth to keep more pieces from falling off while UVA’s architects and preservationists hatched a replacement plan. The crumbling capitals were commissioned by architect Stanford White for the 1898 reconstruction of the Rotunda after the 1895 fire destroyed most of building’s original capitals. White’s capitals were made of domestic, fine-grained white marble that is not as hard as the original Italian Carrara marble that Jefferson had specified. Sixteen new capitals—ten for the south portico and six for the north—were re-created from Jefferson’s specifications by Pedrini Sculpture Studio in Carrara, Italy. Craftspeople from the studio visited the University in fall 2013 to examine the remnants and historical photos of Jefferson’s original Corinthian capitals. They cleaned larger remnants to match marble colors and original carving details, then made laser scans to generate a 3-D model of a historically accurate capital. From the digital 3-D model, a computer-controlled lathe carved about 90 percent of each capital from an approximately 4-foot, 9,000-pound cube of Carrara marble. Skilled craftspeople added details and finishing touches by hand. 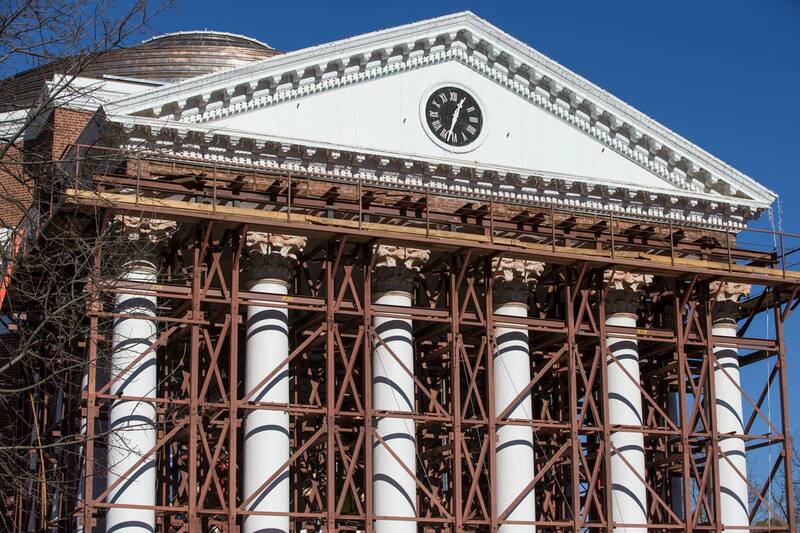 To prepare for the replacement, crews built a shoring system to lift the portico roof by a fraction of an inch and support the roof’s weight, and removed beams, bricks and clay Gustavino tiles to make space for the new capitals. A custom-built track and cart system, supported by additional shoring structures, was installed underneath the portico roof to convey the 3-ton capitals into place atop 25-foot concrete columns. Tektonics Design Group in Richmond designed and carved 40 mahogany capitals for the Dome Room. The new capitals are modeled after the room’s original capitals—with characteristics of both Corinthian and Ionic orders—which were carved from Maine white pine by Philip Sturtevant of Richmond, and are more detailed than the plaster capitals installed during the 1976 renovation. The pine capitals perished in the 1895 fire, so preservationists and artisans looked to pre-fire photos of the Dome Room and other examples of Sturtevant’s work to create a clay model of the original capitals. They also referenced a series of letters from 1824 between Sturtevant and supervisor of University construction Arthur S. Brockenbrough, which include details on Jefferson’s specifications for the capitals. The detailed 3-D clay model was scanned, and the 40 new capitals were carved on a robotic arm machine and finished by hand. The elements of the capitals—the acanthus leaves, volutes and other ornaments—are each separate pieces, which the artisans assembled on a bell-shaped base to form a capital.